Hot and Horny Bunny Grahams. Because who doesn't love an X-rated snack? I know I do. I happened to buy these treats at a popular children's store chain. Imagine my shock and horror when I pulled this pair out of my snack pack. No wonder I can never seem to finish the box - they are multiplying in my pantry faster than I can eat them. That one bunny on the left is saying "WHAT??" 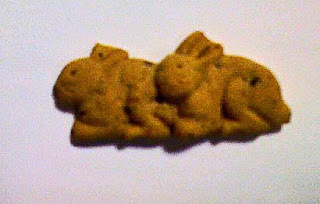 X-rated bunny grahams. What is this world coming to? Someone in the bunny graham factory has too much time on their hands. Of course I ate them Blondie. I think they enjoyed it. The never ending box. Too funny. Hey Wiseass - That's funny. Never ending box - I love it. Question Of The Day - Where's Your Pumpkin From?